WOW. That is fantastic you are doing this! My daughter has been telling me about that show - I need to watch it soon. I hear it is incredible. 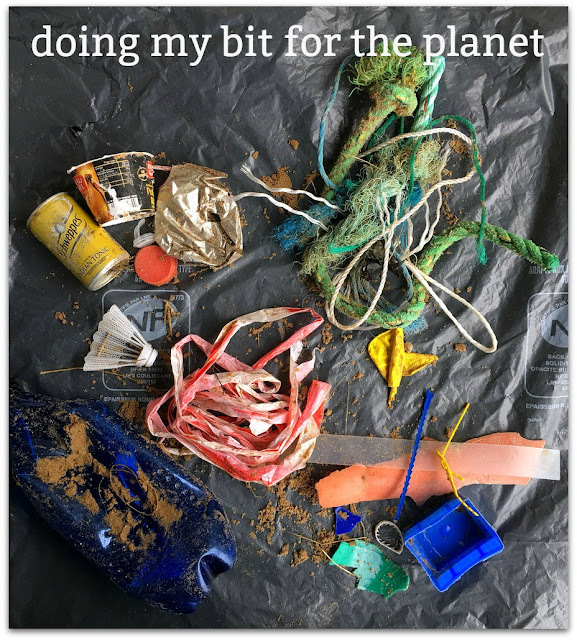 Good job - if each of us did our parts - regardless where - picking up plastic garbage this world would be so much better off. I think you have truly inspired me! Thank you! And thx for hosting. Nice to be back - it's been much too long. Have a blessed week! Wow - amazing job. We always try to pick up things that are discarded inappropriately - every little bit counts. What a great post, Maggie! We all need to do our bit to preserve the oceans (and the land). I'm trying to avoid purchasing plastic as much as possible. Your idea of taking a carrier along to pick up trash is a good idea! 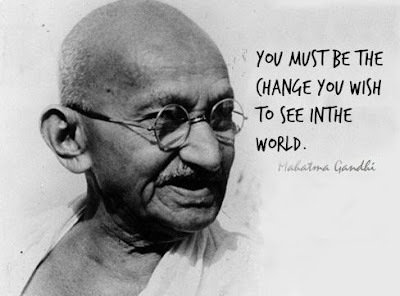 Dearest Maggie; What a wonderful post making us re-realize that the situation ocean is facing. I will try hard not overuse plastic; at least I can do as a little thing. In my city "garbage separation" started about 10 years ago. The day of Collection of Burnable and Unburnable garbage is done differently. I hope this helps preserving nature not only ocean. I admire you what you have stated. 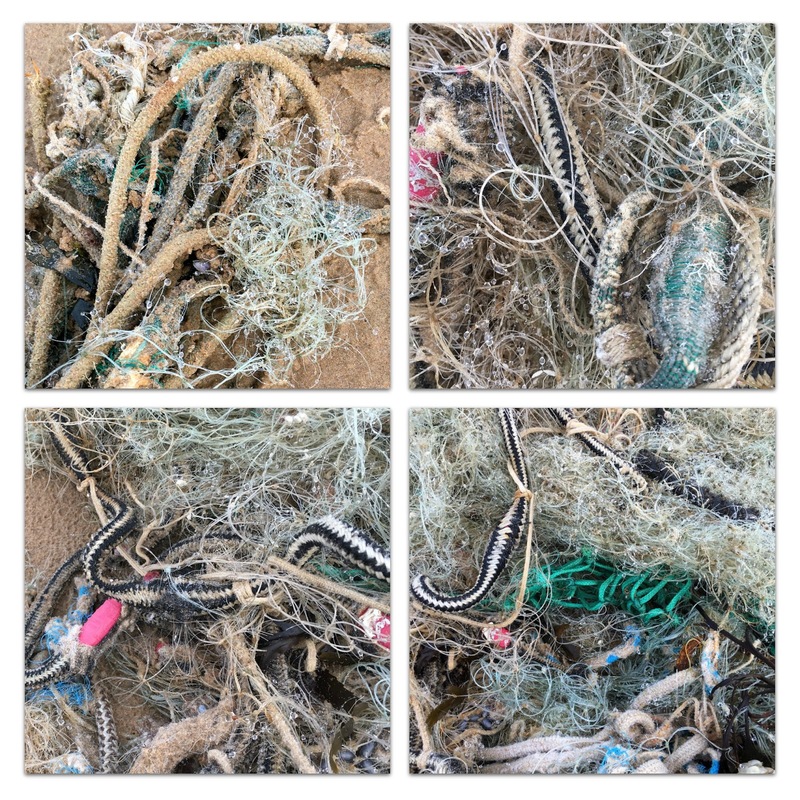 What a disastrous mess is in our oceans! I applaud your efforts to help pick up and safely discard what you find beachcombing, Please amke sure you wear strong gloves when doing so for your own safety, Maggie. 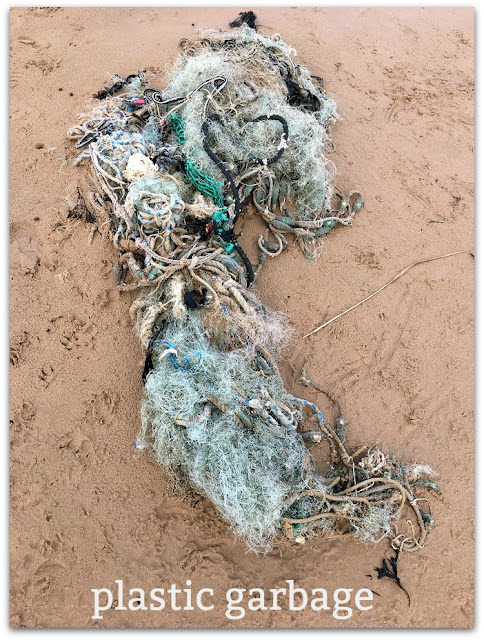 Many fisherman neglect to clean up their fishing lines in the ponds, streams, lakes and rivers in y area, and I know many people here are on the same mission to pick up and dispose of it as it hurst wildlife. I promise to do the same! I also make sure to recycle and use no plastic straws when eating out or use disposable plastic bags if possible, Every bit helps! I wish to applaud you for doing your bit for the universe - clearing the beach of plastic,metal & other debris. I am sure after seeing your action many in your neighborhood will join your beach combing crudsade. Thank you!! We all have an obligation to maintain and save what has been be created for us. We are to be stewards of our own domain! It's a serious responsibility! Wishing you well! I live on a tiny island (we're connected to the mainland by a 2 mile causeway) near Boston. We see quite a bit of plastic washed up here as well. It's quite sad. This is an enormous problem. We were talking about it at a family lunch only a few days ago. Our son scuba dives around the world and brings back horror stories about the scale of the situation. What can we do about the amount of plastic we use - it's everywhere and at the moment we are just piling it up. If we are not chucking it in the sea it goes in landfill - not an ideal solution either. At a local coastal town residents have started a campaign to clear up and reduce use of plastic in businesses and homes....and to encourage tourists to stop leaving rubbish on the beach. 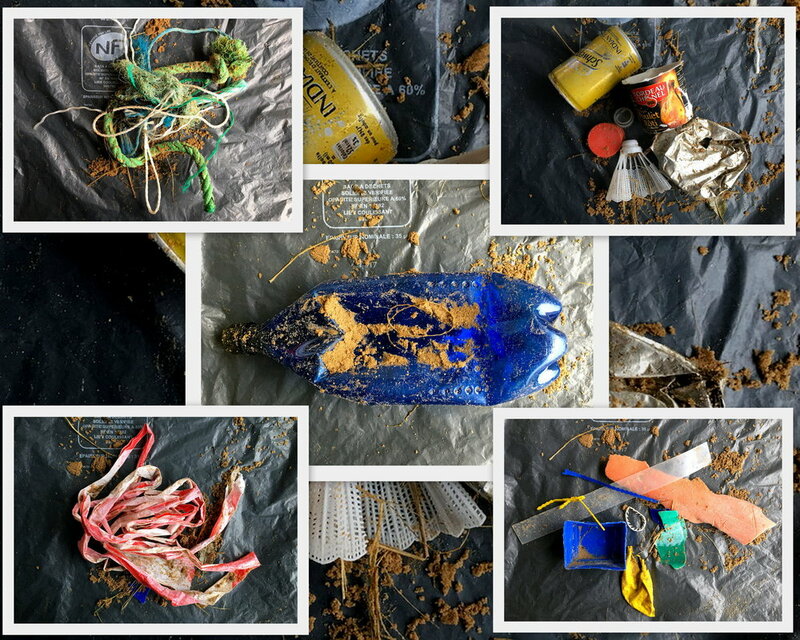 From an artistic viewpoint this rubbish can look beautiful, as your photos illustrate! Thank you for this Maggie. Good for you ..and thank you! We’ve done that kind of thing walking along the Oregon Coast since our kids were young .back then I used to think there was hope... Now...(I’m ashamed of the US record on this as well as on other environmental issues right now, needless to say). I will read the link you provided....thanks for that also and of course for hosting. It is so sad, but I hope it is never too late for us to preserve our planet. Thank you for your host,Maggie.English is my second language. It is not enough to express my whole feeling、sometimes. Have a good day. 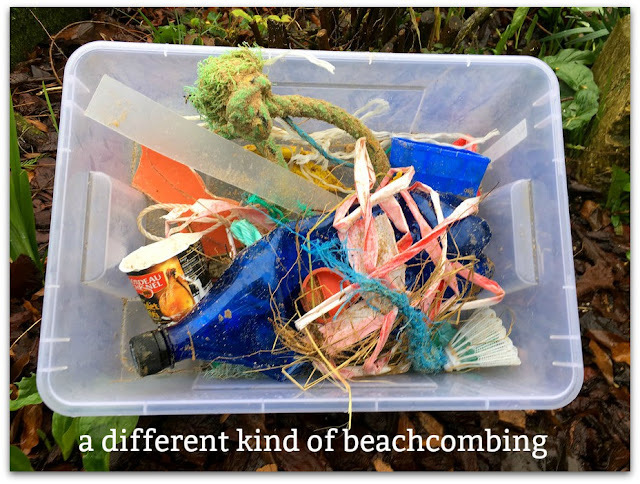 Thanks for picking up what you can along the beach. I know I see a show on Tv about wildlife getting caught in such. Good for you, Maggie! I've been watching Blue Planet II --- amazing!Happy Monday and thanks for hosting. Thank you Maggie for your 71st Mosaic Monday. The trash that binds in the oceans is overwhelming. Appreciate the link. Hi, Maggie. I just found you through Lorrie's blog Fabric, Paper, Thread. We have the same litter problems here on the west coast of Canada. Thank you for sharing your blog and so many others that I've never visited before. Maggie, Every bit counts! Good for you. I love Sir David Attenborough's TV programs. I miss them now that I don't have PBS. Thanks for sharing & hosting. Sylvia D.
If we all did this, think how much better the world would be. Maggie - thank you for 'doing your bit'. Although we are land-bound, many of the restaurants in our area have stopped serving plastic straws ... every little thing counts! Thanks for hosting MM and have a terrific week! Thank you for cleaning up the beach. You even made artistic images from the trash! The plastic rubbish is an ecological disaster. We are making a concerted effort to use less plastic. Have a fabulous week.